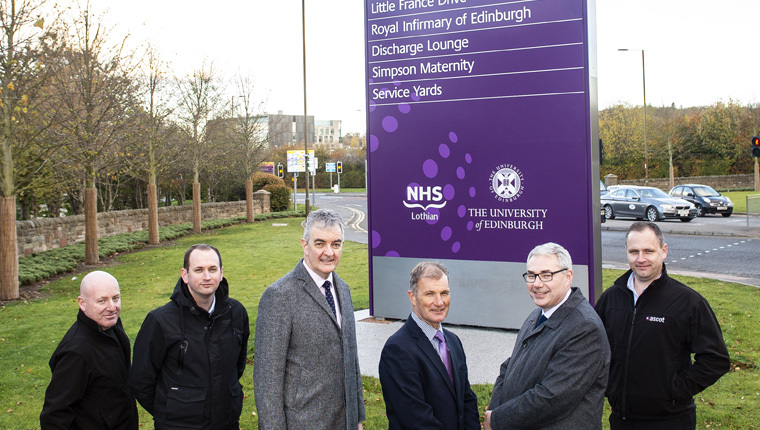 On 29th October 2018, a major signage and wayfinding project was unveiled at Edinburgh BioQuarter. Jointly delivered by BioQuarter’s four public sector partners – the City of Edinburgh Council, NHS Lothian, Scottish Enterprise and the University of Edinburgh – this ambitious project is a practical leap forward in building BioQuarter’s status as a leading life sciences campus for Edinburgh, Scotland and the UK. As well as ensuring patients, staff and visitors enjoy safe and easy access to the 100-acre BioQuarter site, the wayfinding project will make a significant contribution to BioQuarter’s vision of revolutionising Scotland’s health and well-being. The new wayfinding project is intimately connected with BioQuarter’s commitment to campus-wide collaboration between academia, industry, entrepreneurs and the NHS. On site are world-leading academics, clinicians and researchers from the Royal Infirmary of Edinburgh teaching hospital and the University of Edinburgh Medical School and its research institutes. Alongside these institutions is a growing number of young and established life sciences companies. Each day these specialists utilise state-of-the-art facilities to discover new drugs and cures, accelerate commercial developments and make life-changing improvements to the health of Scotland’s people. Clear and consistent signage marks a major milestone in BioQuarter’s journey as a pivotal life sciences destination. Delivered by environmental consultants Ironside Farrar Ltd, the transformational effect of installing more than 90 new campus-wide signs will greatly improve the experience of site users. These include the 7,500 people working at BioQuarter reach day, and the hundreds of thousands of Royal Infirmary patients and visitors welcomed each year. Off site, on the A7, large signposts will direct road traffic to the campus. By creating an accessible and welcoming location, the wayfinding project will be contributing also to BioQuarter’s place and role in the local community and wider city. In promoting science and medical advances, school and community-group visits are commonplace. At a campus for all, the new signage will encourage even more visitors to explore BioQuarter and get the most from their visit. Of great importance is establishing a site attractive to ambitious new entrepreneurs and investors. By contributing to Scotland’s international reputation for life sciences and health discoveries, BioQuarter and its partners can help entrepreneurs grow their businesses here, create more jobs and continue delivering economic benefits to Edinburgh, Scotland and the UK. To this end, the wayfinding project is the latest marker in an ambitious five-year growth plan for Edinburgh BioQuarter. Already one of Europe’s largest life sciences clusters, on the way are a new NHS Lothian Eye Pavilion Hospital and new buildings for the University of Edinburgh Medical Teaching School and Usher Institute for Population Health Sciences. Added to this, advanced plans are in place for additional office and lab science, a hotel, gym and cafes. Dr. Alan Lowdon, Interim Executive Director for Edinburgh BioQuarter said: “These truly are exciting times for the health and life sciences sectors in Edinburgh and Scotland. We are already seeing the very positive effect that Edinburgh as a city and the BioQuarter as a place are having in terms of both generating and attracting high quality businesses to Scotland. The creation of a focal point where world-class research, innovation and entrepreneurship come together to advance patient care is both trail-blazing and very rewarding indeed. The new signage will help to cement this in people’s minds”. Find out more about the successful organisations in Scotland’s life sciences sector here.